Many novice knitters begin with a scarf as their first project since the design itself is simple. Choosing to make the scarf with a basic garter stitch makes it quick and easy, but still a project you are sure to be proud of when it's done. If you are familiar with casting on, knitting, and binding off, then you already know everything you need to make a garter stitch scarf. If you are new to knitting, all you need to know is right here in this simple scarf pattern. You can even use the knit cast on and learn how to knit as you get the stitches on your needle. It doesn't get any easier! Even when you are no longer a novice knitter, a garter stitch scarf is a great go-to pattern. It knits up quickly and you get quite a different look with the smallest adjustments. You can add different textures, use various weights of yarn, work with smaller or bigger needles, and make it skinny or wide. The options are limitless, even with a simple project like this. Buy one skein of super-bulky yarn (size 6 in the Craft Yarn Council's Standard Yarn Weight System), which should be around 100 yards. Lion Brand Wool-Ease Thick and Quick is a nice choice. Use two skeins if you want a longer scarf. The larger the yarn, and the lighter the color, the easier it will be to see your stitches. You will also need size 13 US (9 mm) knitting needles or whatever size creates the gauge you want. It is also helpful to have a crochet hook. With bulky yarn, it is easier to weave in the ends of the yarn with a hook rather than a needle. Gauge tells you how many stitches there are per inch. It's affected by the yarn weight, needle size, and your knitting tension. With the suggested yarn and needle combination for this project, you should get around 2 1/2 stitches per inch in garter stitch. If changing yarn weight, you should also change the needle size to get that yarn's recommended gauge. The finished scarf is about 5 inches wide, but the length will vary depending on the yardage of your chosen yarn and exactly how long you want to make it. Knit this entire scarf pattern with garter stitch. It is nothing more than repeating the basic knit stitch over and over again. That's why it's the perfect beginner's project! By the end of this scarf, you will have this knit stitch down pat and be ready to learn the next stitch. Cast on 12 stitches. This will give you a scarf that's almost 5 inches wide, but you can alter the number of stitches for a wider or narrower scarf. There are a few different ways to cast-on—you can use a long-tail cast-on or try the simple wrap cast on. 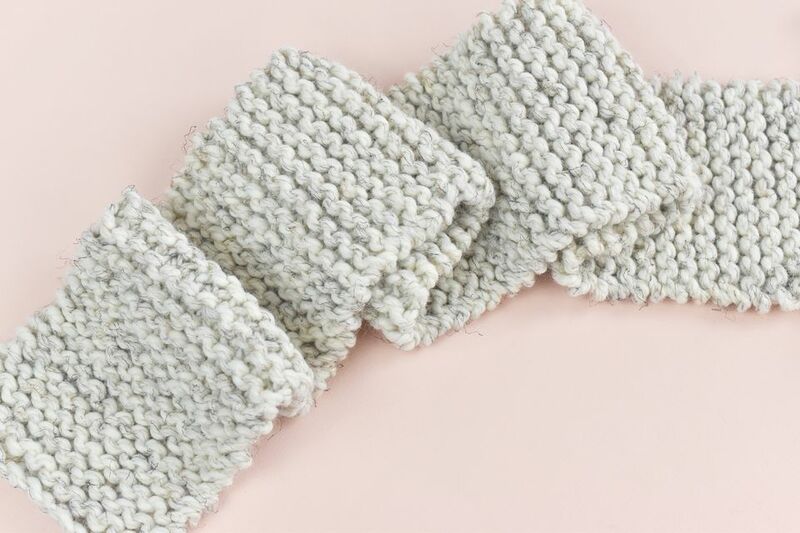 Knit every stitch and every row with the same garter stitch until you have about a yard of yarn left, or the scarf has reached your desired length. You can also add a new ball of yarn to extend the length or add a different color. Next, you need to bind off. Cut the yarn, leaving a tail of about 6 inches. Use your crochet hook to weave in the ends at the top and the bottom, as well as any extra ends if you added a second ball of yarn. This is a wonderful all-purpose scarf pattern that is fun and easy to personalize. You can make it with any kind of yarn or combine two different kinds of yarn. If you want to use a different weight of yarn than the super bulky, check the label to see what size needles they recommend and use them instead of the size 13. You might also need to cast on a few more stitches if you are using a lighter weight yarn to get a nice width—or you can make a super-skinny scarf. Another great way to customize your scarf is with a simple fringe at the ends or with a few handmade pom poms on the corners or along the ends. Once you have a few projects under your belt, you can knit a striped scarf with the leftover bits of yarn. A basic garter stitch scarf is no doubt a project you will keep coming back to again and again throughout your knitting career. When you are comfortable with garter stitch, learn how to purl and then you can try some stockinette projects as well.